Whether you want to learn another language for business (Chinese anyone?) or pleasure (Je m’appelle Ciarán), for that much-needed holiday (otra cerveza, por favor!) or to impress the future Polish in-laws (mito mi poznach..Papa), we have the right course for you. Choose from our morning and evening language courses in Spanish, French, German and Italian. 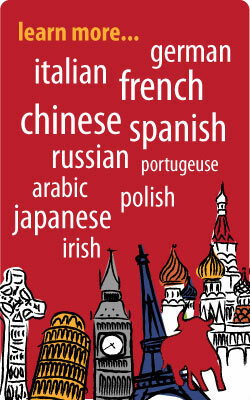 Portuguese, Chinese, Polish, Russian, Arabic, Japanese and Irish classes available for private groups and companies. Our team of experienced, enthusiastic native teachers will have you speaking the language from Day 1! If you really want to learn another language, you’ve come to the right place! when? what time? which days? how long? how much? how many? Early bird: 10% discount until 22 march 2019. Usual price €240. All materials are included in the course price. Not sure which level is best for you to do? Want to know what’s in your course? Ask us to email you the course content. Wondering what you’ll be able to do at the end of your course? Are you a parent, grandparent, No 1 uncle or fairy-godmother? Are you happy with your English? we would love you to share this website with someone you know who would really like to learn a language! Copyright The Language Place © All rights reserved.